Hanoi (VNA) – The Vietnam-Austria joint venture Mavin Group will join hands with Hungarian institutes and firms to improve the quality of carp fry in Vietnam and the Southeast Asian region. 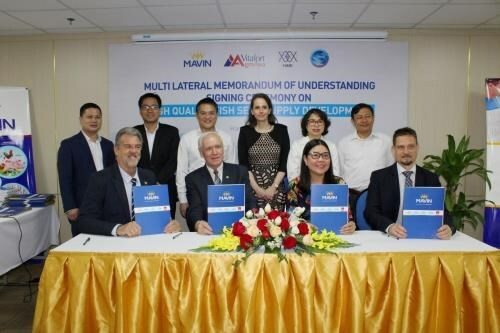 Under a memorandum of understanding (MoU) inked with Vitafort Agro Asia Co., Ltd (VAA) on April 9, Mavin will cooperate with VAA to set up a centre for developing high-quality carp breeding in Vietnam to serve domestic and regional demands. They will research and apply the combined intensive and extensive aquaculture model, as well as cooperate in aquaculture food production. Mavin and VAA also inked a MoU with the Hungarian Research Institute for Fisheries and Aquaculture (HAKI) and the Vietnamese Research Institute for Aquaculture No.1 (RIA1) to enhance research and development capacity, as well as to expand business opportunities in the region. Accordingly, the HAKI and RIA1 are responsible for carrying out in-depth studies to improve the quality of carp breeding, branching out farming techniques, and providing training for local farmers. Meanwhile, Mavin and VAA are in charge of the large-scale production of carp fry and developing business opportunities in Vietnam and Southeast Asia. The HAIKI and RIA have been cooperating on a project on the genetic improvement of carp since 1960 and they have made significant contributions to bettering production efficiency and fish quality in both countries.